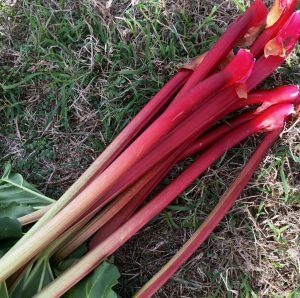 Rhubarb Relish | Patrice Newell's online organic biodynamic Australian garlic and olive oil. Combine all ingredients except rhubarb, stir over low heat until sugar dissolves. Add rhubarb and simmer for 5 minutes. Strain, reserving syrup, then return syrup to saucepan and reduce by half. Pour over rhubarb and cool.